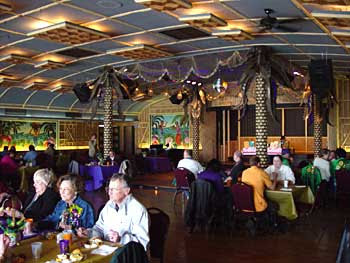 UPDATE: Sadly, the Balinese Room was lost during the early morning hours of September 13, 2008, when Hurricane Ike crashed into the Galveston coast. All that remains are a few piers and the fading memories of those who loved the place.This story originally ran on our other food site, in March of 2003. Way back in post-WWII Texas, one nightclub stood above the rest. 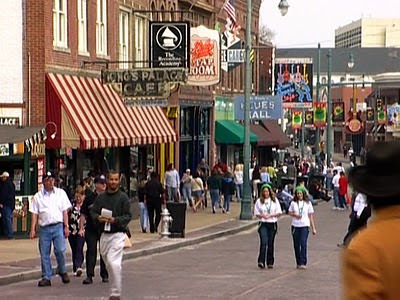 It offered the best entertainers, the hottest crowds, and the best illegal gambling in the state. 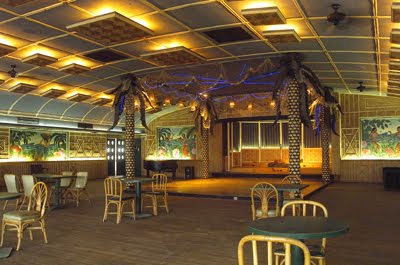 It was the infamous Balinese Room on Galveston island, the swankiest spot on the Gulf Coast. 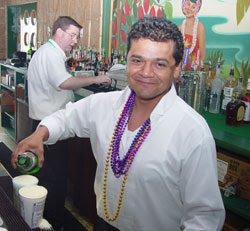 The Balinese was the jewel in the crown of Sam and Rosario Maceo’s Galveston-based empire. The Maceo brothers were Italian immigrant barbers turned bootleggers, who ended up as a gambling club owners. Their holdings on Galveston Island were immense, and their influence helped Galveston weather the depression far better than most other cities across the nation. The Maceo empire was the dominant force on Galveston Island during this period. It included the Turf Athletic Club, often referred to as the “Weekend Bank of Galveston”. The TAC would cash checks and loan money for its patrons. 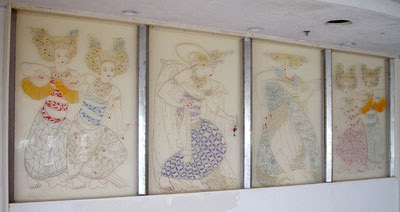 The Balinese started its storied history in 1923 as the Chop Suey, at 21st and Seawall. It was closed nine years later for a gambling violation. Four years after that, it reopened as an oriental restaurant and night club, called the Sui Jen. The Sui Jen was a successful enterprise for Maceo, but as with the modern restaurant business, it’s often time for a change. Maceo had a new idea for the Sui Jen. America was in the midst of World War II, and at the time, many Americans were uneasy with all things oriental. 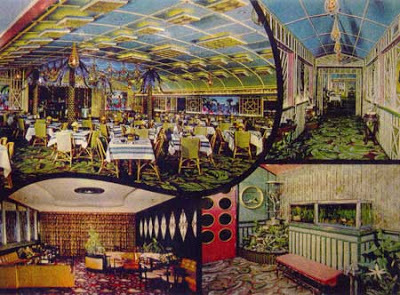 Ever the astute businessman, Maceo remodeled the Sui Jen in a South Seas motif, and christened it the Balinese Room in 1942. In its heyday, The Balinese played host to high rollers from all over the country, including local legends Glenn McCarthy, Diamond Jim West, and Howard Hughes. The showroom featured headliners such as Frank Sinatra, Sophie Tucker, Burns and Allen, Bob Hope, and Jack Benny. 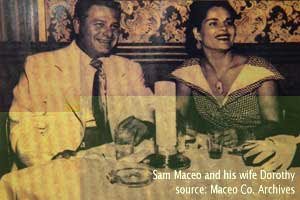 Long before Las Vegas attracted the big names to the desert, Maceo’s Balinese Room brought ‘em to Galveston. For many years, the Balinese resisted attempts to shut down its illegal activities. According to one former employee, the Balinese was raided on 64 consecutive nights without a single bust. Its defense was ingenious. The casino was at the far end of the pier at 2107 Seawall, about 600 feet from the entrance on shore. When the Texas Rangers would raid the place, a buzzer sounded in the gaming room, and chips, cards, roulette wheels, and other gambling devices were hidden in the walk-in safe, or in special compartments in the walls. The gaming tables would be set with tablecloths, china, and silver. The band would strike up “The Eyes of Texas”, and patriotic patrons would stand up and start singing, and the crowd would slow the progress of the rangers rushing to catch gamblers in the act. Local law enforcement looked the other way. Frank Biaggne, sheriff of Galveston County from 1933 until 1957, was asked why he didn’t raid the notorious place. He replied that it was a private club, and he was not a member. The Balinese Room’s luck ran out on May 30, 1957, when new sheriff Paul Hopkins made a raid. He demanded entrance, and two detectives (disguised as gamblers) who were already in the casino stopped employees from stashing the evidence. The charges stuck, and the equipment was confiscated and destroyed. The Balinese Room was finally shut down, and sat empty. In 1961, Hurricane Carla tore through Galveston, and damaged the former hotspot. Many of the piers that supported the structure had been washed away, and over the subsequent decades, the building decayed further. No one would have been surprised to wake up and find that the Gulf had swallowed up the old structure after a heavy storm. Fast forward to 2002. After several false starts, someone has finally resurrected the famous Galveston landmark. Houston attorney Scott Arnold is the man behind the new Balinese Room, and he’s off to a great start. As you drive up, you notice that the damaged piers have been replaced, the 600-foot long building has been repaired and repainted, and the atmosphere of neglect is gone.Entering the building takes you into the new gift shop, featuring a collection of new Balinese Room merchandise, and some interesting artifacts, such as the original chalkboard ledgers that were used to tally the odds for baseball betting. The faded names of the old Texas League teams could still be read. Further back along the pier, you’ll pass new businesses along the long, narrow hallway. A hair salon, an internet café, a metaphysical shop (featuring psychics, crystals, and swords) and a massage studio (with a unique glass floor that looks down upon the waves under the building) lead you back to the entrance to the Balinese Room proper. These small shops represent a departure from the original Balinese. 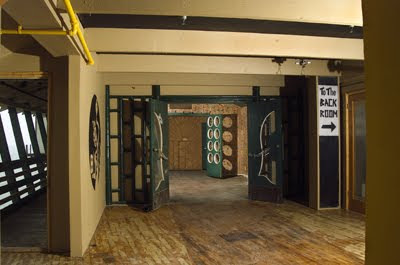 Finally, one approaches the entrance to the first big room. There we met Scott Arnold, attorney and real estate speculator. Scott showed us around, clearly proud of what he’d accomplished. And for good reason. The work that’s been done to the once-decrepit Balinese Room is nothing short of spectacular. On our right, brunch was being served in the showroom. A buffet was set up in what was previously the hat check room, and the folks were lined up to sample the offerings. But we didn’t come for the food. Scott led us into the showroom, and we were stunned. It appears to have been meticulously restored. The bamboo and reed wall coverings, now kitshy and retro, lined the room in their South Seas 1940’s splendor. A good-sized crowd was enjoying the brunch buffet at tables spread around the room. The Sunday afternoon crowd was a bit more casually attired than the high rollers who frequented the Balinese in the past, but they were still having a wonderful time. Many assembled here today were wearing their Mardi Gras beads; it was the Sunday before Fat Tuesday, and the night before was the pinnacle of Galveston’s annual Mardi Gras celebration. 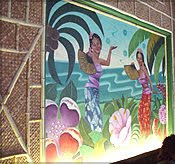 The old South Seas murals looked brand new; according to Arnold, they only required a light dusting after all the years of neglect. The palm trees, resplendent with black neon, fish netting, and an assortment of glass globes and sea artifacts (all original) looked just as they must have before the Rangers shut down the Balinese. An older couple took to the dance floor and moved gracefully to the music. They were smiling and having a wonderful time. I had to wonder if their parents had done the same thing fifty years ago. I asked Scott Arnold if I could see the old casino room. He smiled, and led me to a door at the back of the showroom. He unlocked it, and we entered the once forbidden space. “This room required the most work” Arnold noted. And the work was still going on. New flooring had been put down, and a fresh coat of paint lined the walls. Arnold showed me where the gambling machines used to sit. Around the room were panoramic windows looking out into the gulf, and over to the Flagship Hotel on its nearby pier. Behind me, I noticed some beautiful acrylic drawings. Arnold told me that they were original, and some of the oldest works by Grace John. Many investors would be tempted to sell off this memorabilia, but Arnold plans to keep them right were they are, keeping a watchful eye over the back room. Scott Arnold has big plans for the Balinese Room. He’s looking for a restaurant tenant, and a nightclub. Unless the laws in Texas change, gambling won’t be returning to the Balinese room, although I get the feeling from many of the folks visiting for brunch that they wouldn’t mind. We reentered the showroom, and I talked with one of the bartenders; Jose Rey. He told me the story of the legendary Balinese room bartender Santos Cruz, who mixed a new drink for singer Peggy (Margaret) Lee in 1948. He named that drink after the Spanish version of her name: Margarita. You could sense Jose’s pride that he was working in such a historic place. By the dance floor, the same piano that Duke Ellington used to play was being put to good use by a jazz pianist. She sang and played a selection of jazz and Big Band hits, and her voice filled the showroom with magic. In many settings, the music would have felt retro, almost silly. But here in the Balinese Room, it felt right. I was sorry I’d left my tux at home. Over the years, I’d often talked with friends about the glitzy history of Galveston, and how the island is a shadow of its storied past. We talked about how amazing it would be to see the notorious Balinese Room brought back to its former glory. And now, thanks to Scott Arnold and his vision, it’s happening. On this Sunday during Mardi Gras, I found myself standing in the storied showroom of the Balinese Room, listening to my father’s music, and loving it. For a moment, I lost myself in the music and if I squinted just right, it was Saturday Night, I was back in the 40’s, at the swankiest joint on the Gulf Coast. 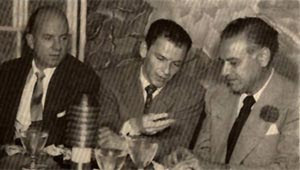 Duke was on the keys, Sinatra was singing, and I was tappin’ my toe, living the Delicious Life. For those folks who’d like to experience the Balinese Room in person, the club is currently (as of March 2003) open most Friday and Saturday nights with live music, as well as the Sunday lunch. Look for the hours to expand as summer approaches. Man, it's rough that this place is gone. Forget the Bishop's Palace: the Balinese has always been the first piece of Galveston history I tell new friends about when they visit. My great aunt was a working girl there (I won't be specific) and she met her husband, a card shark, at the Balinese Room. Being able to walk out on that pier was a physical reminder of the history and legitimacy of the city. This is a real piece of Galveston, Houston, Gulf Coast, and Texas history we've lost.